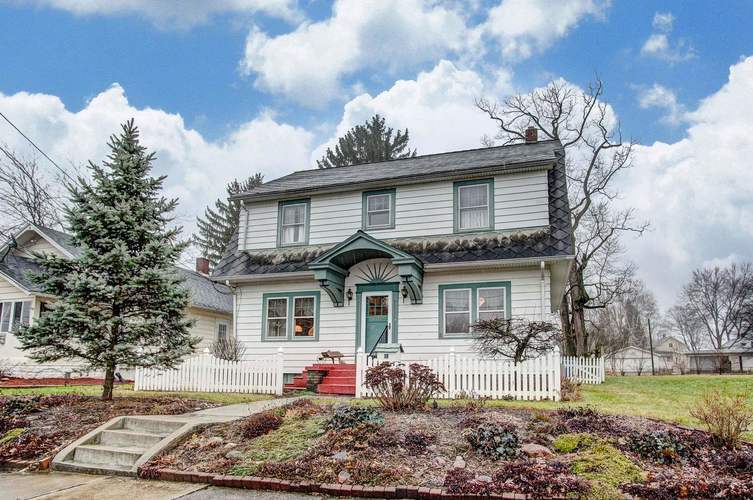 Beautifully maintained Dutch Colonial style home with loads of character on quiet dead-end street. Landscaping and white picket fence make for great curb appeal and welcome you onto the covered front porch. Inside on the main level you'll find a large 25'x12' living room and gorgeous hardwood floors in the dining room. The kitchen has an abundance of counter space and refaced cabinets with new doors and under cabinet lighting. Upstairs are 3 spacious bedrooms, landing area with built-in linen cabinets and laundry shoot to the basement. Master bedroom has a nice alcove area that could also be made into a walk-in closet. In the basement is another large 24'x15' living space/family room with ventless gas fireplace and a storage/utility room with shelving that remains. All kitchen appliances and washer and dryer stay! The large backyard is a great space to retreat in its grassy area, patio, 2-tier deck and gardens all surrounded by a privacy fence. 1 car-detached garage and shed for additional storage. Longevity of a slate roof! Affordable utilities average per month $88 for electric, $68 for gas and $77 for water/sewer and trash removal is $22 a quarter. Easy access to 469 and 2 blocks from the New Haven library. This is a truly unique and wonderful property! Directions:Green Street to Canal. West on Canal. Home is on the Right.